Russian gas exporter is on track to beat last year's sales to Europe, after a resounding increase year on year. Even if Russian gas exports to the European Union (EU) in June were slightly down (-1.7%) vs May, we are still witnessing an impressive 11.2% growth year on year. For H1 2018, Gazprom exported 83.7bn m³, up 2.9% (or 2.4bn m³) vs H1 2017 (exactly at the same level as H2 2017). 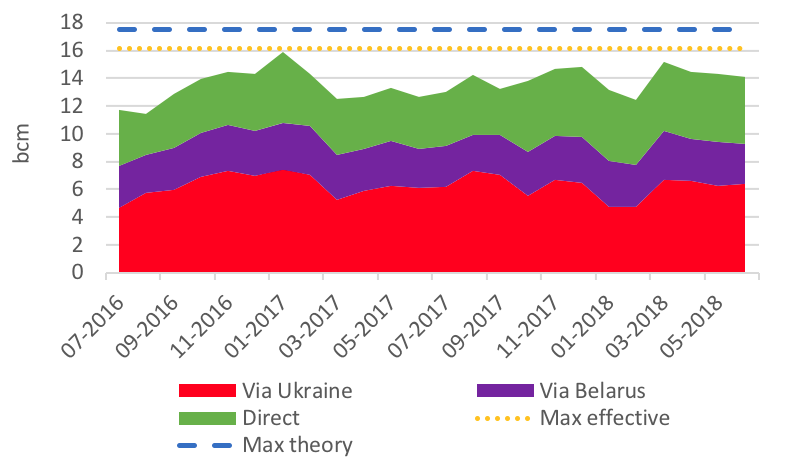 It is interesting to see that Gazprom is maximising its direct route, also known as Nord Stream (+21.3% in H1 18 vs H1 17) at the expenses of Ukraine transit (-6.6%). 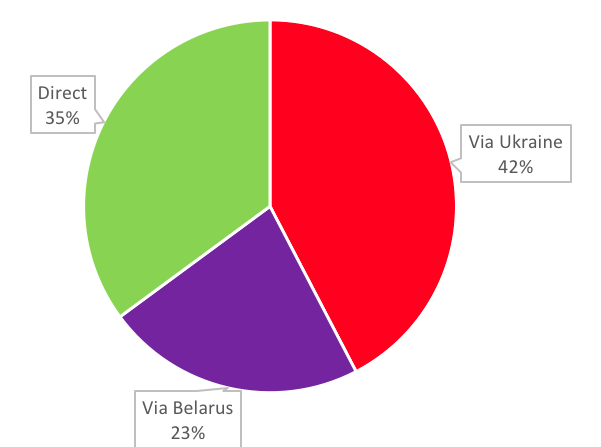 Exports via Belarus are only down 1.5%. As discussed in https://www.naturalgasworld.com/russian-exports-to-eu-up-in-oct-on-nord-stream-56523 since the lifting of the ban in 2017 on using the German onshore Nord Stream offshoot, Gazprom rightly prefers for economical reasons to use Nord Stream 1 as it pays the Ukrainian transit fees on a volumetric basis. 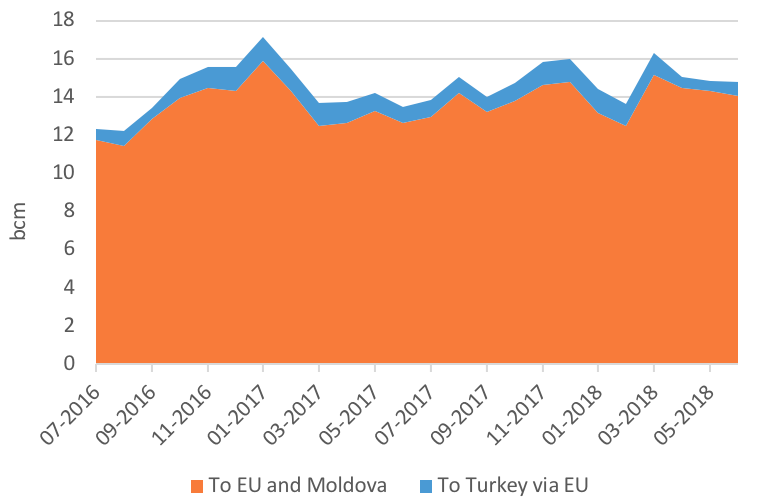 So even with higher exports to the EU, Ukraine transit fees are therefore down so far this year by 6.6%. Even if some of those exports are going into depleted storage, it is likely that 2018 will mark, as Gazprom CEO stated, another record year for its sales into the EU. 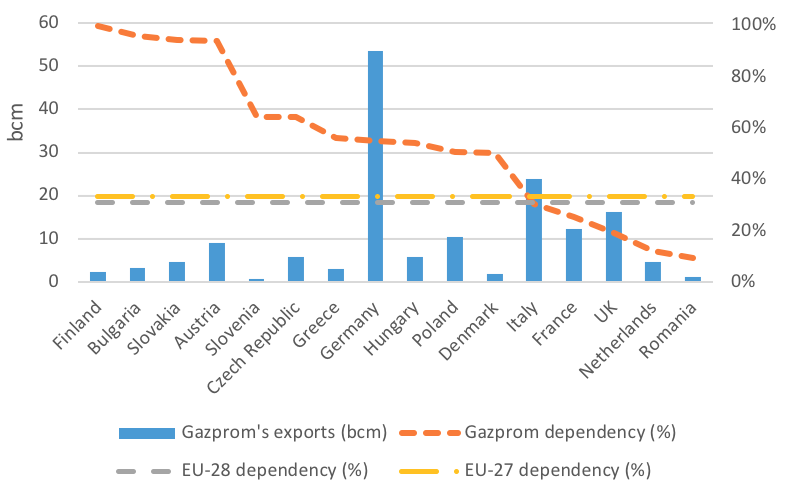 If EU gas demand does not grow as fast as Gazprom’s sales, we could see our Gazprom dependency going up above the 2017 level (31% for the EU-28 and 33% for the EU-27). In all cases, with Yamal LNG up and running since end of 2017, our dependency on Russian gas is going to increase. In his speech to shareholders (http://www.gazprom.com/press/news/miller-journal/2018/546908/), Alexei Miller says: “According to provisional data, Gazprom’s deliveries to that market will stand at 101.2bn m³ of gas in the first half of 2018, an increase of 5.5bn m³ (5.7%) from the same period.” Note, 'that market' refers to part of the EU and Turkey. We focus on EU only with EU standards for m3.